Some five miles to the south of Lake City, Colorado there’s a trail head for a very scenic hiking spot called Alpine Gulch. It’s one of the more picturesque trails in the area featuring a path that climbs through the forest beside a picturesque mountain stream, which it crosses at several points as it moves steadily up towards the tree line. True to its name the initial portion of the trail travels through a very narrow, steep ravine, one that’s heavily wooded with an abundance of ground cover, groves of aspen and stands of mature pine that spiral up as high as 70 feet above the ground. For as long as can be remembered, everything within that setting remained status quo until just a few years ago when a large red sign was placed adjacent to the entry of the trail, with bold white letters it pro-claimed, “Lynx Recovery Area”. This statement indicated it had been selected by state wildlife officials as a preserve to introduce Canadian Lynx to this vicinity. Being quite remote with ready access to water, flush with game it had all of the necessary requisites to sustain a Lynx population and hopefully to have them start to breed. In talking to the game wardens about the program they said that they felt extremely positive about the programs long term potentialities, but as an additional insurance they had placed radio tracking collars on the Lynx before being released. Additionally, all of the Lynx released were adult, breeding aged animals. Last summer I had occasion to take an early morning hike in Alpine Gulch, it was a pristine Colorado day, the sun was just starting to filter through the upper branches of the trees in the ravine and as I strolled along the trail, a movement caught the corner of my eye. 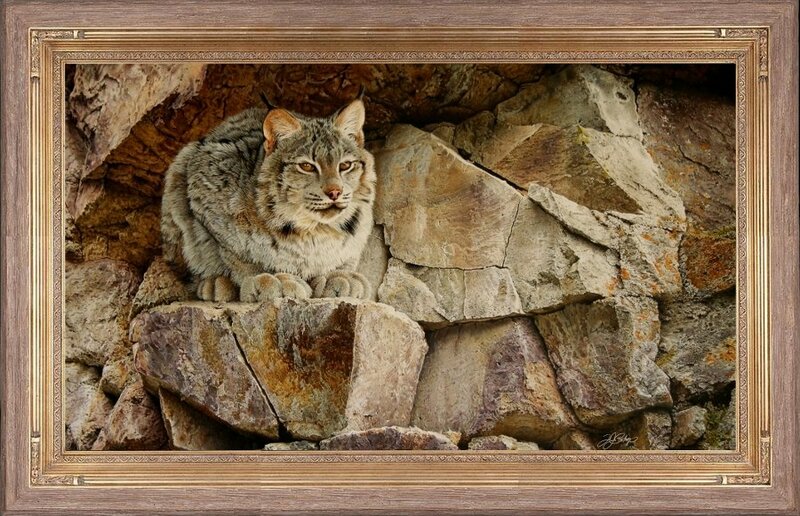 I squinted and looked through the trees, I was amazed as I watched a young Lynx slowly move out onto a rocky out cropping on the opposite face of the ravine. It settled down onto its haunches and stared intently in my direction, ears twitching, licking, cleaning its immense paws and long whiskers in the soft early morning light. Given that it had no tracking collar I’m assuming that this was an offspring of some of the original Lynx placed in the area. I watched it for several minutes and it stared back at me with large dark hazel eyes. Not wanting to disturb it, I moved quietly up the trail and continued on my hike. A couple hours later as I came back past that area I looked, but didn’t see any traces of the Lynx. Needless to say, the image of the cat remained in my mind and I knew that it was something that I should paint. 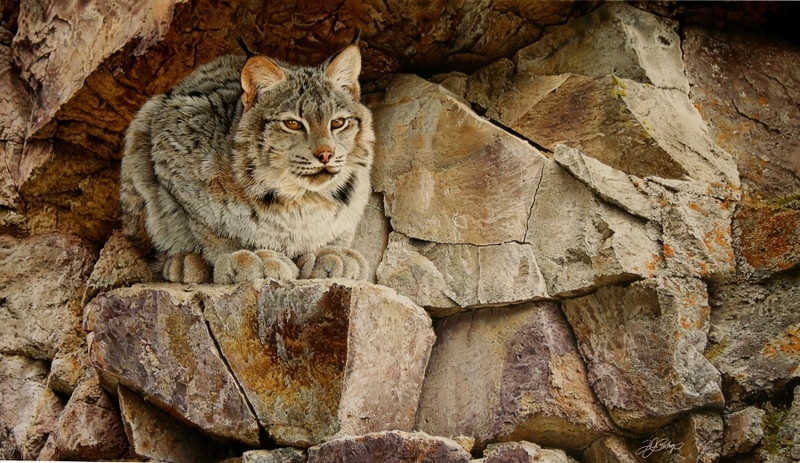 A few days later I returned to the site, camera in hand and after crossing the steam to the side it had been on, I scrambled up the side of the ravine, climbed a large ponderosa pine, enabling me to get a shot of the exact spot in the rocks where the cat had been crouched, it’s “Vantage Point”. The outcome is apparent on this page.